As building parts and capabilities developed in the building model gains an increasing importance for the overall construction business, there is a need for unique descriptions of the content of the building model in regards to the objects geometry (level of detail and precision) and capabilities. In moments of agreement where parties need to come to terms with the level of detail, precision and information regarding objects. This is typically agreed upon and documented in a model deliverance specification. When supporting the project process, where there often is a need for determining when certain information should be delivered and by whom. For the purpose of establishing a simple method to indicate content, DiKon has taken starting point in cuneco’s general levels of information, which is developed on an overall informational level. In order to enrich and concretize this work we have developed a catalogue of the most often used building categories (22 categories) along with their specific level of 3D detail and information/capabilities for each informational level. By referring to an informational level one obtains an exact and uniform understanding of which information each object should contain. The model delivery specification hereby specifies who should deliver specific information within the model in regards to the agreed stages of the building process. 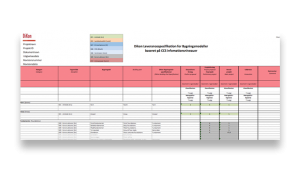 The model delivery specification is free to be download and used by all parties within construction if mentioned that the tool is developed by DiKon – Digital Convergence. 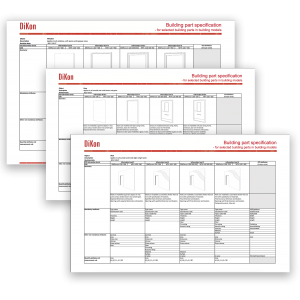 DiKon’s Delivery Specification needs to be adapted to each specific project! The tool is an example of how an agreement can be structures and the six member organizations of DiKon have all used the tool in connection with relevant projects. When utilizing the tool it is important to read the introduction/user, which can be found in both the PDF file and in the Excel file. 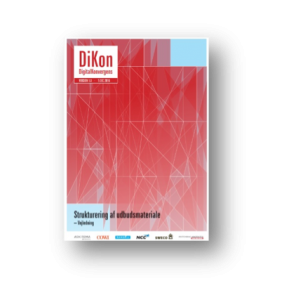 DiKon’s “Structuring of tender materials” should be viewed as best practice regarding structuring and description of the tender materials digital context, including the requirements of the consultants to the tendering party regarding digital services and collaboration. The reason behind the development of the publication is that Digital Convergence has experienced substantial divergence in the structure, correlation and unambiguity in the way that the construction business describes the different digital services within the project material used in individual trade- and general contracts. The purpose behind the publication is partly to help consultants develop and ensure the quality of the structure and the unambiguity within the project material and to help tendering contracting companies in efficiently identify the services within the project material. This leads to a more effective tender process and fewer misunderstandings.